Long-time readers of my blog know that I routinely talk about Assassin's Creed games. Whenever a new one gets released, it rises to the top of my to-play list. And for good reason. Regardless of the quality of any one installment, each entry has something, a feature or a flaw, worth discussing. The latest game in Ubisoft's long-running alternate history franchise is no different. Unlike past games, Syndicate features two lead characters, twins named Jacob and Evie Frye, who take London by storm. This use of two protagonists allows Assassin's Creed: Syndicate to do a number of interesting things with both its play and its plot. The most obvious being that it allowed Ubisoft to contrast and cater to the two major playstyles that players can generally be sorted into when playing Assassin's Creed. As the more athletic of the two, Jacob loves a good brawl. He's more than content with attracting the attention of large groups of enemies and beating his targets, and anyone who looks like they might try to stop him, into a bloody pavement pulp. If ranged combat is needed, Jacob will just bring out a pistol and go in loud. Meanwhile, his sister takes a more silent approach. Though she can handle herself in a fight, Evie prefers to sneak around undetected. She isolates enemies and takes them out one-at-a-time, being careful not to attract too much detention. Rather than rely too heavily on her gun, she takes wields throwing knives that can kill ranged enemies quietly. While either character technically can perform in combat or stealth, they have clear preferences towards one or the other. This neatly maps to the two common Assassin’s Creed player archetypes. Some people are just fine with rushing to a mission objective, killing everyone in sight, and completing their assigned task. Stealth or finesse isn't important. What matters is only that the mission is done at the end of the day. Others would willing redo the same mission over and over until they've “perfected” it by completing all the optional objectives and avoiding detection. It's not just about completing the mission. It's about keeping mistakes to an absolute minimum. Though these descriptions are more representatives of extremes on a sliding scale, and less hard-and-fast alternatives, it can be broadly said that most will gravitate towards one or the other. By having Jacob and Evie together, both extremes can be catered to and defended in the game. Even in the story, both characters represent these playstyles through their conversations. Being the more detail-oriented of the two, Evie constantly admonishes her brother by pointing out the sloppiness of his work and the unexpected consequences of his actions, especially in comparison to how she carries out her assignments. But Jacob gets just as much opportunity to defend himself by pointing out that he gets things done, often faster and more efficiently than his sister. The game doesn't preach in favor of one style or the other. Rather, through these contrasting characters, it acknowledges that both extremes, and everything in between, are valid ways of doing what needs doing. 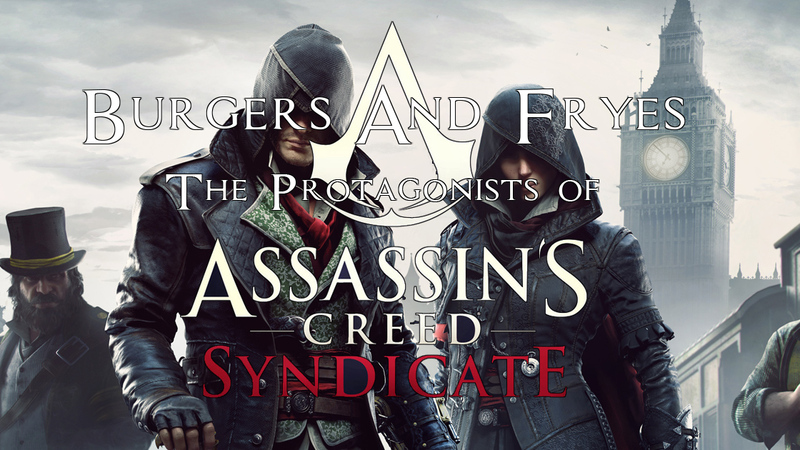 As a pair, the Frye twins also allowed Assassin's Creed: Syndicate to explore the same story through multiple viewpoints. Because he tends to be the go-getter of the two twins, Jacob performs most of the tasks often associated with a typical Assassin's Creed protagonist. He’s the one who goes after most the high-ranking Templars, by discovering who they are, sabotaging their operations, and ultimately assassinating them. In many ways, his missions offer the “typical” Assassin's Creed experience. While Evie gets in on the action with her own separate story-missions, Jacob takes the lion's share of these assassinations. This frees Evie up to do something fairly unique in the context of the series. Usually, after the mission in which the main character kills one of the Templars, that target's influence on the world is suddenly rendered null and void. They no longer matter, and we can safely move on to the next target without exploring the potential effects of their removal. In Syndicate, in the next sequence following an assassination, Evie gets a moment where she revisits the scene of Jacob's crime, exploring the aftermath. One early sequence has Jacob target a corrupt doctor who was brewing and distributing an hazardous and addictive “tonic” to the people of Victorian-era London. When Evie enters the situation later, she agrees that killing him and cutting off the supply of tonic is a good thing. However, Jacob failed to note that doing so only solves part of the problem, and creates others. This doctor wasn’t only responsible for the distribution of the tonic, but also for providing other, beneficial medicine needed by the poorer citizens. By removing him, Jacob has inadvertently made it possible for gangs to swoop in and take over both the distribution of medicine and the creation of tonic for people those still addicted. Though Evie does what she can to help in this mission, it is ultimately up to other characters, who aren't involved in the Assassin/Templar meta-narrative, to start setting up the infrastructure needed to truly solve the problem. Through these post-assassination missions, Ubisoft appears to launch a subtle critique of their very own stock storyline. In almost every other Assassin's Creed game, assassinating every major Templar magically fixes every problem. By using Jacob and Evie to explore these assassinations from different perspectives (one before and during the kill, and the other afterwards) Syndicate posits that the actual kill is only the start of fixing the problem at best, and at worst makes it harder to come to a permanent solution. It's not enough to take down the existing economic and logistical frameworks without taking steps to replace them afterward. Otherwise, the situation can only get worse. Without Evie, it would be much more difficult to make this point in an elegant manner. On their own merits, neither Jacob nor Evie would be particularly interesting characters. What makes them worth noting is what they allow Ubisoft to do in the context of an Assassin's Creed game. By throwing together two characters with different personalities, and making them work towards the same ends, there styles forced to clash with each other. Using their interactions, Assassin's Creed: Syndicate explores some of the franchises central gameplay and story tenets with an uncharacteristic self-analysis. Hopefully, with this insight, the series can continue to improve itself.